Maybe it is the influence of Grandma, who creates amazing quilts using wonderful fabrics that include bugs, Buzz Lightyear, chile peppers and dinosaurs. Maybe it is the influence of Dad, who tells stories of how impressed a certain young lady was when he pulled out a sewing kit and offered to sew on a button that had popped off her jacket. (Because I certainly never carried a sewing kit with me!) Maybe it is just all the gears and levers and gadgets on modern sewing machines. Whatever the reason, my boys are interested in knowing at least the basics of how to sew. When we received the You CAN Sew! Curriculum from Modesty Matters, my kids took one look at the projects... a pin cushion, an apron, a skirt, and a dress... and the teen BOYS immediately said, "Since this is school, you'll buy the material and such, right?" When I said yes, they said, "So we have Trina's Christmas and birthday gifts covered. Cool." But then we found out that there is a brand-new Boy's Supplement (not yet available on the website). For that, the projects are a pin cushion, a nail apron, pajama pants and a pajama shirt. They decided that it might be more fun to make those. Of course, our schooling this fall has been pretty hit or miss. One child or another has been sick. Not just sick, but 'crashed out in bed refusing to eat even when I offer ice cream' sick. That has made it rather difficult to get them all working on this more than a day here or there. So we did not get anywhere near as much of this done as I hoped. 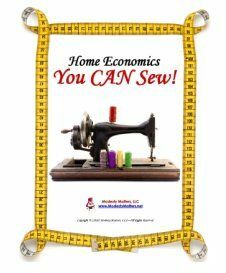 So what is You CAN Sew? 5 DVDs, containing 65 video "classes"
The boy's supplement includes a DVD with video classes for the class sessions related to the "boy" projects, plus a CD that contains the patterns (in child and adult sizes) and a pdf of the text for the boy project lessons. You Can Sew! costs $159, and is intended for non-sewers and beginning sewers of almost any age. Trina (6) has been working through the lessons at a much slower pace than her brothers, but I'm going to focus on their experience and not hers. Well, one thing that frustrated me right off the bat is that the time involvement in the lessons is really all over the board. Some lessons take a few minutes. Some take a LOT longer. Once I realized that, I could deal with it. Initially, though, it made me a little crazy that I couldn't just plan "1 lesson = 1 day" especially with the first lessons. We'd watch the video classes until we felt we needed to stop and actually do all of the homework. Some days, we'd watch 4-5 lessons. Some days it was just one. Then, since I am a fairly accomplished seamstress, I found the pacing agonizingly slow. But I started sewing doll clothes when I was in kindergarten, and making my wedding dress was a no-brainer decision. So this course isn't meant to teach ME anything, except maybe how to slow down enough to teach a beginner. My boys found the initial pacing to be a bit slow, but they conceded that it was really a good thing to have to do things like thread the sewing machine a dozen times in a row, so that they truly knew how to do it. In retrospect, that is something I wish I had been made to do. All of those beginning skills are treated that way... practice them a few times until you are comfortable. And keep samples of your work in a notebook. A mastery-based approach to sewing. The text and videos give so much information about things I would simply never think to address, and I love the time spent on practice, before you get to doing any real projects. We did jump ahead to watch the first Boy project... the work apron. Even though we weren't far enough in the initial lessons to actually take on this project, my boys felt that the instruction was clear and they felt encouraged that they really could do this. That is one thing about the video instruction (that is far better than anything I'd do) -- she is encouraging. We printed off the pattern for the apron, and while I don't love e-patterns, this was fairly straightforward to put together. I loved the notebook the kids are building. The videos have a few little editing quirks, but nothing that was more than maybe a bit distracting at times. Overall, I think this is a really nice product, and I hope to check out their brand-new quilting curriculum at some point too. You've inspired me to try using this with Brennan some day. I always just assumed I would skip over him and go from Addison to Lauren. Thanks!